It took months of rehabilitation, but Emmy and Oscar have finally recovered! On July 6th, TAF received a call that the Chicago Police Department had just rescued 2 dogs from an abandoned building and needed assistance getting them emergency medical care. At 1 am, TAF met the officers at the ER Vet and Emmy (red pup) and Oscar were transferred into our care. Emmy is severely underweight at only 24 pounds… she should be close to double that. Her bloodwork showed that her body is in starvation mode and she is anemic. Emmy is receiving IV fluids and several small meals a day. Given how thin she is, and that her system is essentially depleted, we need to be very careful how much, and what, she eats. Sadly Oscar is in worse shape. His body has gone into starvation mode and he is suffering from hypophosphatemia. This means there is not enough phosphorous in his blood which causes a reduction in the amount of oxygen getting to his heart, red blood cells, skeletal muscle cells and brain cells. His liver enzymes are also elevated which may mean he is dangerously close to liver failure. Oscar was immediately started on IV fluids as well as vitamin B and other electrolytes. 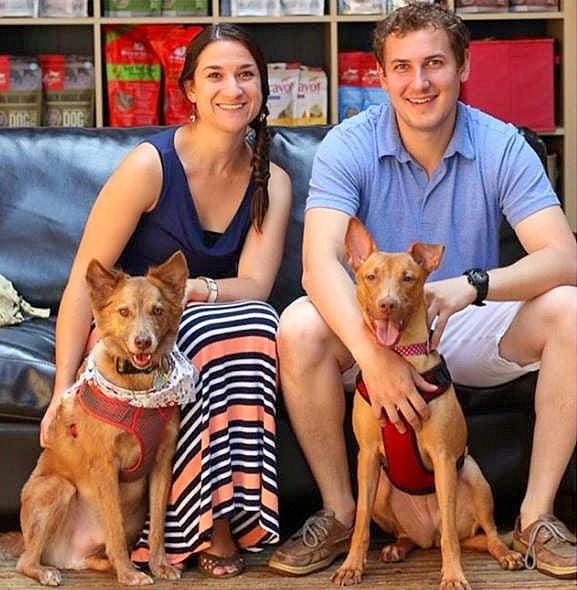 Oscar and Emmy are both on a slow feeding regimen to prevent “refeeding syndrome” that could overwhelm their starved systems and cause organ failure and even death. Several small, high fat meals are fed over the course of the day. This is to slowly allow their bodies to adjust to having food and nutrients again. The next 48-72 hours will be critical in terms of seeing how both of their body’s respond to the fluids and nutrition they are receiving. Update 7/8: Since Monday, Emmy’s bloodwork has begun to stabilize. She is slightly more alert and is also able to keep food down. Even though she looks skinnier than Oscar, Emmy is actually in a bit better off. Oscar, on the other hand, remains in critical condition. His bloodwork shows a slight positive rebound, but his liver values are still alarming. In addition to the IV electrolyte supplements and fluids, his medical team has added medication that will help flush out any toxins so we can see if the values improve. He is eating his special meals and is able to keep down food. As you can see by the expression on his face, he is having a rough time and looks as though he has lost hope. Please keep these two in your thoughts and prayers. Before they only had each other and now they need our help to survive. Update 7/22: Well… if this doesn’t give you a reason to smile today, nothing will. Emmy and Oscar, the two starved pups left to die in an abandon building, are well on their road to recovery! Emmy (left) should be about five pounds heavier than she already is and Oscar has about 10-15 pounds to go. They are both independently social and have no problem when it comes to going on walks without the other one. They are just happy as could be when given the love and attention that they have always deserved. Again, thank you to the Chicago Police Department for going above and beyond to save these two! We will continue to keep you updated on their progress! Update 7/29: TAF would like to ask that you keep Oscar in your prayers. Oscar is one of the dogs that was left in an abandoned Chicago building nearly starved to death. After being hospitalized on supportive care and now fully regaining his strength and confidence back, Oscar has shown some significant behavioral issues that we are not taking lightly. Four people have already been injured by Oscar and his level of aggression is escalating as he gets more comfortable in his surroundings. We have trainers working with Oscar but we just wanted to give you a heads up on the situation. Update on Emmy, end of August: During her hospitalization, Emmy fell for one of her vet technicians and he fell for her. When Emmy was weak and didn’t want to leave Anthony’s side, he would drape her around his neck and carry her around like a little fawn… this is when Emmy was happiest. As Emmy started to gain her strength back and put on some weight (19 pounds), she was not about to give up her favorite routine with her new best friend. Since Emmy was now allowed to walk around the back rooms of the vet office, she would search for Anthony so that he could hold her. Thankfully, Anthony had a strong back and a heart of gold! When it came time for Emmy to come back with us, Anthony had a very hard time letting her go. In fact, he teared up when we picked Emmy up to leave. It would take almost losing her to another home for Anthony to realize that he couldn’t lose his favorite girl. It was then that Anthony asked to take Emmy home with him… the two haven’t missed a day of work since. A big thank you to the Chicago Police Department, Emmy’s medical team and TAF supporters for giving Emmy this second chance at a new beginning! For some reason… this second chance seems more beautiful than most! Update 9/14: After over two months of both medical and emotional rehabilitation… Oscar is ready for adoption! During Oscar’s several weeks of training, Oscar has proven that he can trust people, play with dogs, and listen well. He is a happy-go-lucky dog the majority of the time, though he has some fear issues that are residual from his past. Oscar needs a home where people are going to keep up with his training, be consistent and be confident to show him the ropes. He could either be an only dog or he could be a buddy for your existing pup… he will go with the flow. Oscar is good in his crate, walks nicely on leash, is awesome in the car, knows all his basic commands and LOVES to play. He is pretty lazy, as most bulldogs are, and sleeps a lot. 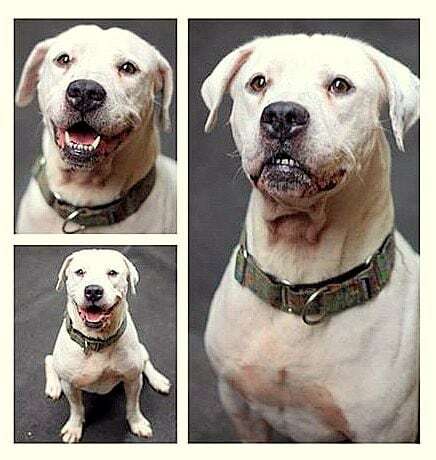 If interested in adopting Oscar, please visit our website www.trioanimalfoundation.org and click on the “Adoption” icon. There you will find info about our adoption policies as well as the application. If you have any questions about Oscar, please email [email protected]. Thank you so much to Oscar’s supporters… without your prayers and financial contributions, this would not have been possible! Why, oh why would anyone do such a evil thing. I hope they go to a good loving home…lovely dogs! And now they are smiling! Perky eyes too! Tom Mitsoff – Skipper’s ear partner! Praying for them. We have a similar case here in FL except the dogs were left out in the sweltering heat. I don’t understand how people can be so cruel. I could never let my dogs end up looking like this. I’ve given up my own meal so my babies could eat. They are everything to me. I would never betray the love and trust they have. This makes my heart HAPPY! ❤️?❤️?? Look at the transformation just on their faces. So amazing. They look so much better! Thank you! Thank God for the people in this world who rescue and save all these fur babies out there. Just to see these beautiful happy faces makes my heart melt. 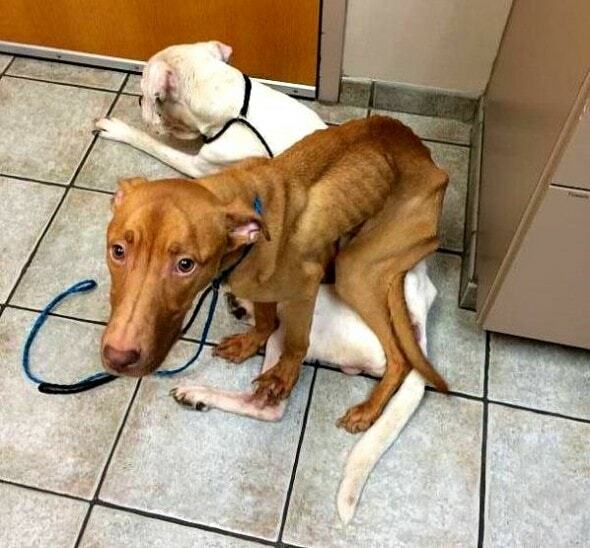 How long would a dog not have any food or water to be in that condition? Poor things. People can be cruel and senseless. They must have been in a shock to be left all alone….imagine the trauma they went through…. god bless their saviour…..Good to see them happy….. 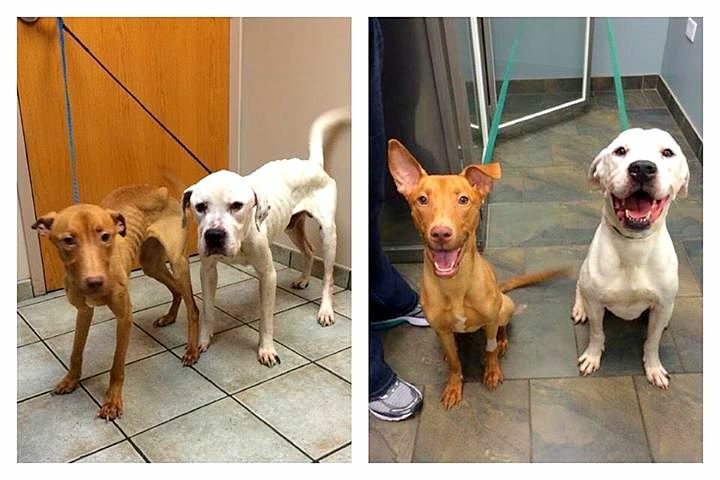 The looks on the “after” pictures say it all…thanks to all of those who rescued, saved, and rehabilitated these 2 pups! Grateful for Angels among us?. These pups?are so blessed❤️?? Beautiful! Bless those who saved them. So glad they were rescued & getting healthy! Wish they could stay together since they’ve been through so much together! Healthy and happy!! Thank YOU!! ❤️?? The looks on their faces before & after says it all!???? ?? heart breaking. …then good. .. It makes me so happy to read good news like this. Look at those happy faces! ! Bless them and everyone who helped them! Whoever rescued these babies is an amazing human being! Thank you!!! Love and tenderness makes the difference! It’s a miracle how they survived that tragic moments, their human should experience what they have been through, thank God for the rescuers. Holy cow they look great now! 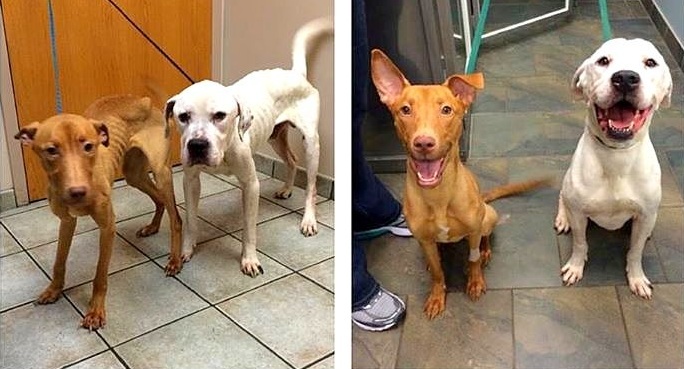 Love their happy smiles in the “after” photo. Thank you to their wonderful rescuers! Oh my God! To whoever took care of these precious pups and brought them back to health…Thank you so much!!!! You are angels walking this earth. ?? Cowardly bastards that would do this. So happy that they are thriving! Look at those sweet, sweet smiles! Those faces say it all ? Sick scum who starved them!! How cruel people are. God bless these loves. 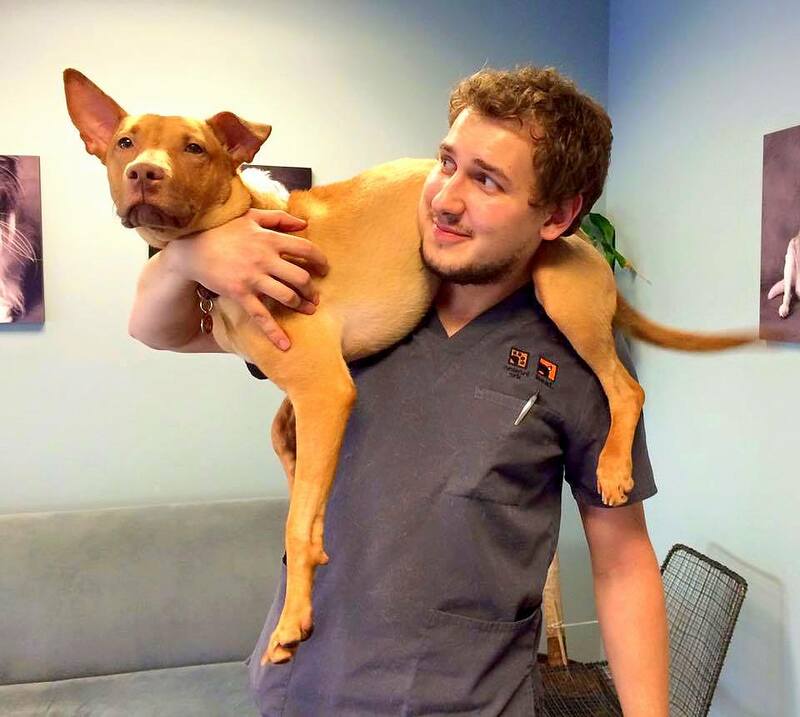 Trio Animal Foundation does amazing things. Everyone should look up the story of Hazel Grace on their page, because her recovery is truly remarkable. Looking good and ready fir the furever homes!!! Beautiful babies-thank you for rescuing them! Thank you for the work you do !! From sadness to smiling faces!!!! I’ve given up looking for the why or how someone could do this because no answer would ever suffice. The fact is people have always and will always do things like this. My biggest question is what can we do to stop or at least cut down on the occurrence. Since my initial response is highly illegal and morally wrong I look to more realistic solutions. What legislation can we lobby to have passed and who can we trust to fight to pass it! I would love input because with an increase in awareness I believe we can band together to make more of an impact than ever before!!!!! So happy to see Emmy and Oscar doing well.